Jeromesville, old Rt. 30, Ohio Territory – Settlement of Ambrose Austen (1757-1843), wife Susan & other Austens and Pearces. 2. Leesburg, PA, Rt. 19N, Mercer Co. – General Store of William Hill (1799-1875) and wife Sarah after they moved just west from Centerville, now Slippery Rock. 3. Greenville, Rt. 18 north of Mercer – Second home of the Pearce Woolen Mill and home of Uncle John Pearce (1831-1893) and wife Amelia from 1885 to 1904. 4. Woolrich, Rt. 220, Clinton Co. – Final home of Pearce Woolen Mill products & label after 1927 sale and move of operation from Latrobe in 1960. The mill closed in 2018. 5. Harmony, I-79, Butler Co. – Original home of Pearce Woolen Mill, America’s oldest blanket factory founded in 1804, after purchase from Harmonites (Harmony Society) in 1864 by banker and our uncle, Alfred Pearce (1816-1895), and his brother John. 6. Middlesex Twp., Rts. 8 & 228, Butler Co. – My homestead and that of my parents and grandparents, Pearces & Grays. My home is gone now to make room for a Sheetz. 7. North Park, Pearce Mill Rd. & Babcock Blvd., Allegheny Co. – Original settlement of our Pearces in 1820 and birthplace of my father, Ralph Hill Pearce (1917-2002). Our land was taken by eminent domain in 1927. Take a virtual tour of North Park family sites. 8. West Deer Twp, Rt. 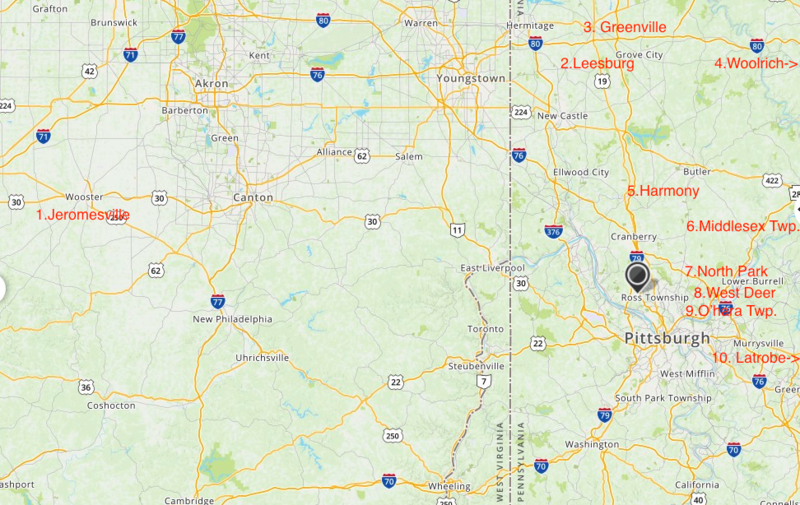 910, Allegheny Co. – Farm settlements of grandparents Campbells, Grays, and Norrises mostly after a treaty with Native Americans and moves from the East in the early 19th century. 9. O’Hara Twp, Rt. 28, Allegheny Co. – Original settlements of Crawfords and Campbells on the hill overlooking the Allegheny River. 10. Latrobe, Rt. 30 – Third home of the Pearce Woolen mill along the Loyalhanna River after 1904. The building still stands. Also former site of the Rolling Rock Brewery and birthplace of Fred Rogers and Arnold Palmer. The Pittsburgh Steelers train there. 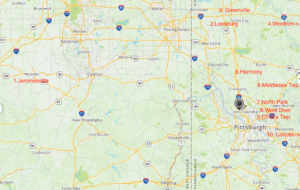 As our research continues, both online and in person, we hope to add to the above map to include such dignitaries as Uncle McLeod M. Pearce (1874-1948), the late President of Geneva College on the banks of the Ohio River in Beaver Falls, PA. He has a spacious men’s dormitory named after him, and his father William constructed the grand administration building. Check back for new stops on our historical and genealogical tour, and please comment below or e-mail me with your impressions of these locations and ideas for additional coverage. *For exact locations see Google Maps and/or cemeteries’ GPS readings in Vitals sections.